We started the lab with extracting DNA from our sample fish. We were given a data sheet to write in unique ID code and Restaurant species name. I wrote JK-01 for Pacific Rock Cod, JK-02 for Fresh Dover Sole fillet and JK-03 for Ahi Tuna. I then put on my gloves and grabbed three 1.5ml Screw-cap and Locking Ld microcentrifuge tube and labled my unique ID code both on the side and on the top of the tube. I was then able to cut each samples with the razor blade and weigh it to be about 3mg. I took the tiny piece of each samples aside on the paper. Next, I added 100µl of Extraction Solution (ES) to each of my labeled sample tubes using a p200µl micropipette and unfiltered tips. And I added 25µl of Tissue Preparation Solution (TPS) to each of my labeled sample tubes using a p200µl micropipette and different unfiltered tips. 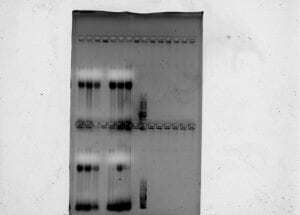 After gently mixing those two reagents, I then carefully added correct samples in the correct tubes. Using a disposable non-filtered pipette tip, I gently mashed my tissue sample so that the solution is misty. I then left my samples at room temperature for 10 minutes and put it into the heat block (95 celsius) for 3 minutes. After I took the samples out of the heat block, I added 100µl of Neutralizing Solution (NS) using a p200 pipette and filtered tips and mix by vortexing. By vortexing, it will mix up my samples vigorously. After vortexing for about 5 seconds, I then put my samples into an ice box full of ice. First we labeled three microcentrifuge tubes with “1:10” and wrote out our unique ID code on the top and on the side of the tube. To dilute my gDNA, I added 18µl of water into each microcentrifuge tubes that I just labeled and then I transferred 2µl of my gDNA (JK-01,02,03) into three different tubes. After my gDNAs were diluted, I made a master mix for my table (a volume x 18). To make a master mix (a volume x 18), I added 115µl of water,180µl of REDExtract-N-Amp PCR rx mix, 14.4µl of Forward Primer and 14.4µl of Reverse Primer; a total volume of 324µl. 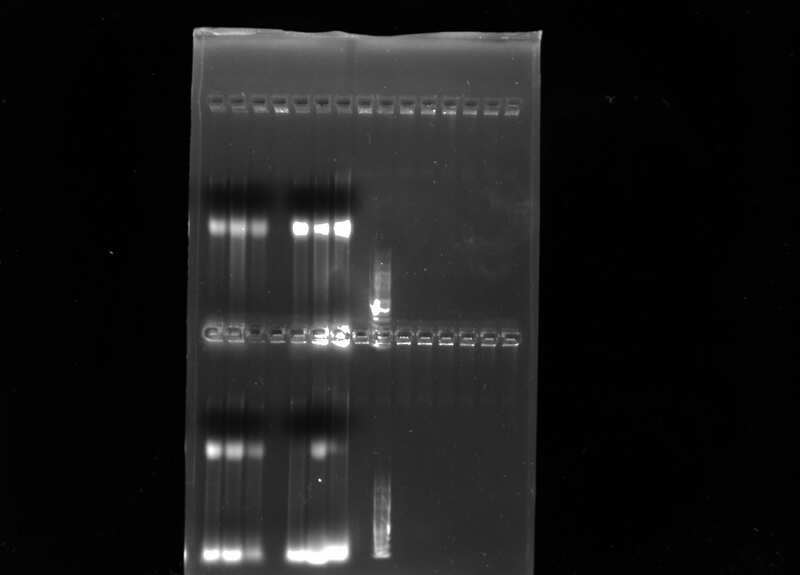 I then add 2µl of the dilute gDNA to each of my PCR tubes that were labeled earlier (changed tips between each sample). After that, I added 18µl of the master mix into each of my PCR tubes (changed tips between each sample). We then as a class put our samples into the thermocycler. 30 cycles of: 94℃ for 30 sec (denaturing), 52℃ for 40 sec (annealing) and 72℃ for 1 min (extension). The left one is the genomic DNA picture and the right one is the invert genomic DNA picture. 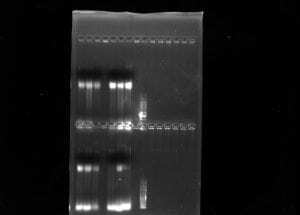 We can see that our group as a whole had a successful run because we could clearly see our DNA with black color looking at the invert genomic DNA picture. Right bottom looks mostly successfully so I guess its good. After the lab, we put all our micropipettes into the shelf and put away the tips as well.